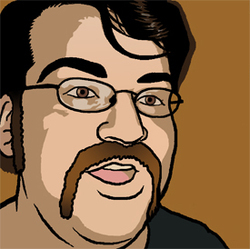 A Temple University graduate and longtime Professional Neckbeard, Phil Kahn has spent a few years writing for various webcomic, webcomic criticism, and webcomic enthusiast sites, and is now trying to take his accumulated knowledge and put it all to good use on Guilded Age. While building a daytime career as an IT Support Specialist and Pokémon Trainer, he also spends a great deal of time practicing silly voices/faces in front of a mirror for the inevitable day where the only thing that can save the whole of humanity from certain doom is his impression of Henchman #24. Out of the three creators, he is also totally that Gnome Warlock who "just won't DIE ALREADY." He was nominated for Comic Book Writer of the Year in the 2012 Philly Geek Awards.